Join the discussion on our forums! Come discuss Protect the King over in our dedicated Protect the King discussion topic. Considering the chess rule that if a pawn reaches the other side it becomes a queen, if the pawns attack face they should become 4/6. does this work with Fire Plume's Heart?? or is this the diference between play and summon ? It does not work with Fire Plume's Heart. 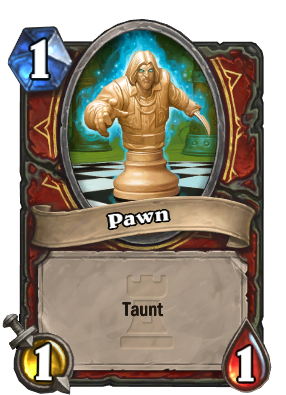 Notice the 'Play' in the text, which implies that you are playing the minion from your hand. For contrast, Awaken the Makers has the text 'Summon', meaning that Onyx Bishop bringing a deathrattle would count as summoning, therefore furthering the Quest. The Text in Protect the King! is 'Summon' as opposed to 'Play', meaning it would not further the quest. Ok, I thought this card was pretty bad, but it's actually a good card in control warrior IF you run doomsayer. The obvious thing everybody is thinking is to make a bolster deck, but that is really inconsistent. If, however, you play control warrior with Brawls, Doomsayers, and Protect the King!, you have tons of control, removal options. doomsayer is the flex card here, that can be played in the early game, after a brawl to keep the board from filling back up, or after protect the king. It's the same cost as freeze mage's Frost Nova / Doomsayer combo, and while not as good (vulnerable to AOE), it still guarantees at least your opponent making extra effort or playing spells they would have rather used elsewhere. Consider how aggro decks will smork face, even if you have a trade or two on the board. If you play this card, then trade one or two minions, they have an additional 1-2 taunts they need to get through before they can touch the doomsayer. Again, not an insanely good card, but after playing it in this situation I think it's highly underrated right now. Oh, another note. This card is AMAZING in fatigue situations (which control warrior run into a lot). No removal left, a couple of minions on the board. Even one round of you doing damage to them that they can't do to you can win the game. Bolster is a great card to boost the pawns. For 5 mana, you can have as many minions as your opponent all at 3/3. has the potential to be a broken card. I know it's been said a thousand times....but really think about the bolster combo with this....7 mana....double bolster, means up to 7 5/5s with taunt...and that's jsut 3 cards. You don't even need to build taunt warrior around it, just include 4 cards in a midrange warrior deck and any deck who wants to fill the board will lose just to this pretty much. Zoo would just run Shadowflame if this deck was everywhere. PO + Shadowflame. 2 cards, 5 mana completely clears your 3 cards, 7 mana. protect the king + the old warsong commander= unleash the hounds for only 6 mana!!! Crying rn because all you jackwagons wanna flap about bolster combo fantasies making this great against zoo. This card is ALREADY good against zoo. and we ALREADY have a good counter to zoo on turn 5. It's called Brawl. Control warrior is all about surviving aggro onslaught long enough to get to high mana turns so they can swing the game in their favor. That's an issue because aggro shaman and zoo can end games on turn 6 or 7. Because of all the damage they get in with just a few minions and temporary buffs in the first few turns, letting them finish up with doomhammer rockbiter and leeroy power overwhelming. On turn 3 or 4, aggro and zoo usually do have 3-5 minions on the board. 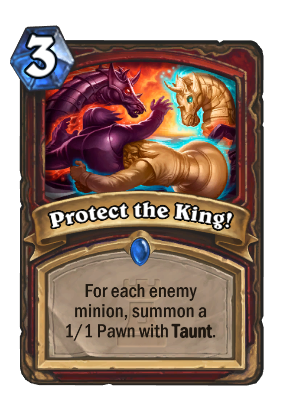 So Protect the King will shave 1 hp off of all of those minions while also preventing what could have been like 8 damage dealt to your face that turn. Most of their minions have to overkill the pawns and you benefit from that. The other thing I haven't seen anyone mention on here yet is that any time your opponent doesn't have a lot of small minions, they're going to have a few big ones, and this card is STILL good in that situation. Your opponent's 7/7 or 8/8 has to throw itself into a 1/1? awesome. You made your opponent use an expensive board clear just to get rid of your 3 mana card? also awesome. But you know what's really awesome? turn 8+, there's a combo that's actually worth talking about. Protect the King + Brawl. If your opponent has a ridiculously strong board (3 legendaries or something) to your nothing, you can brawl it to get rid of 2 of the three, leaving one strong legendary, OR you can play this first, and you have a 50% chance of wiping your opponent's board fully while leaving a taunt in play for yourself. Personally can't wait for moments like those. Can you? well if you see good zoo players, they know something we call to not overextend. this means that they dont play too many minions to play around a board clear. its also weaker than unleash the hounds, and might not see that much use. we will see about that. I think good combo is , Leeroy Jenkins , Protect the king and Bolster . Great combo only 10 mana to cast too kappa. It should've been named 'Unleash the Taunts' Such opportunity missed... why blizz, why?